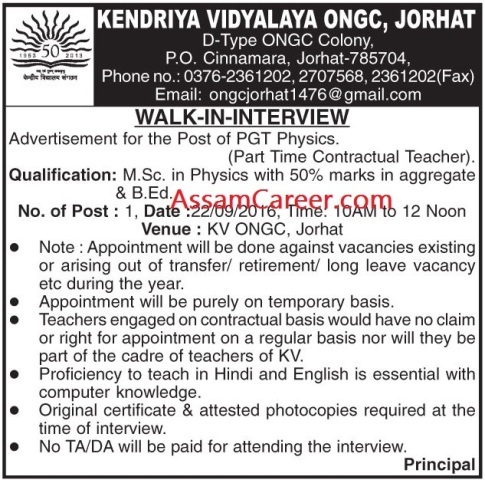 Applications are invited from eligible candidates for filling up of the following vacant post in Kendriya Vidyalaya, ONGC, Jorhat. Educational Qualification: MSc in Physics with 50% marks and BEd. 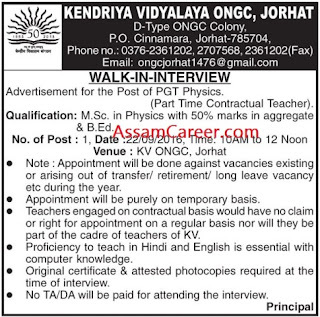 Proficiency to teach in Hindi and English is essential with computer knowledge. How to apply: Candidates need to produce original copies of certificates and mark-sheets at the time of interview.